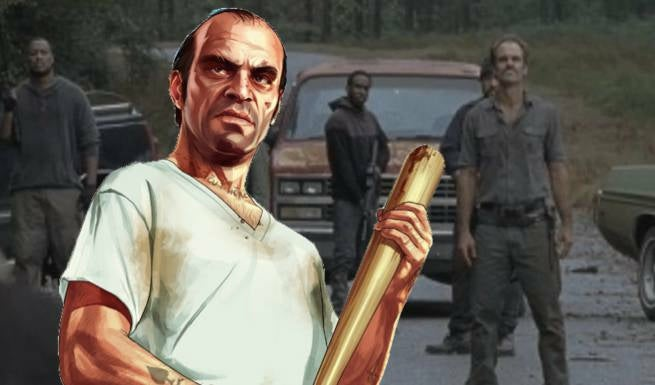 Back when The Walking Dead ended its sixth season, Grand Theft Auto V actor Steven Ogg made an appearance on the show as one of Negan's right-hand men. The actor, who has worked on shows like Better Call Saul and Broad City before, will presumably be back at least for the Season Seven premiere -- since it picks up where the notoriously controversial cliffhanger from last month left off. Ogg talked to ComicBook.com about his role in the finale, and whether he can say anything about Season Seven. With The Walking Dead, everything is so shrouded in secrecy that when people saw you and hadn't heard you'd been cast, a lot of them assumed it was just a cameo. Will your character be back? You know the best quality about secrecy? It's a secret. Ha ha! It was so amazing to be apart of that episode. Above and beyond the show itself are all the cast and crew that make it happen! Such a WONDERFUL group and inspiring for their commitment and work ethic, not to mention the talent on board! Did I avoid that question subtly enough? Ha ha. Well, it is a season finale/cliffhanger so chances are you might see me around next season. You are primarily a live-action actor, but because of the scope and scale of the projects where you've done voicework, all the headlines were "Grand Theft Auto's Steven Ogg..." Does that take some getting used to? Being celebrated for something that isn't the main part of your career? Not sure what a "live action actor" is exactly, but I like to believe that an actor is an actor. You ARE or you are not. It kind of leads into the idea that now a days, the business as it exists today, you are either a working actor or NOT. The division no longer exists between film, TV, theatre, video game, or commercial. People might VIEW each differently, but honestly if you have a gig you should feel very fortunate. The "voicework" was actually like any other acting job in the other mediums. It was simply an animated performance. In some senses it was harder because in mo cap an actor wears spandex, covered in balls(yes, laughter is always necessary upon hearing that particular expression) and a helmet with a camera with light mounted on bars 8inches from your forehead. Combine that with a set made entirely of apple boxes, bars, and colored tape and you begin to get a sense of the commitment needed by an actor for their character and their environment. Obviously besides The Walking Dead, you've also got Westworld coming up. Do you feel like your video game work has opened up genre projects like those, or is it just a question of where your career and the industry are headed right now? I like to believe I booked the jobs because I was the right actor for that particular role or project. The world of GTA V has certainly brought me a lot of exposure and recognition, but I'm still auditioning for each role and proving myself to be an actor you want to hire for the project. I've been very thrilled to be a part of such iconic projects - I count my blessings while looking forward to what lies ahead. Is this the first project you've worked on where people in your civilian life are heckling you for spoilers? I remember hearing that Zooey and Emily Deschanel used to get asked who killed Laura Palmer on the school bus because their dad was on Twin Peaks. I've actually not had a lot of that heckling for spoilers at all. Of course I JUST got asked literally moments ago, but they were totally knowing I wouldn't say even if I could. Of course people ask, but I find the majority - like my son Bodhi - ask NOT to know anything. I do not understand the whole "spoiler" thing at all. If you do want to know then fine- guess, dig and do whatever you have to for your own personal satisfaction if you enjoy knowing the ending of a book before reading it. Yet to "spoil it" for others? I REALLY don't understand the mentality behind that move. When you've got a part with not a ton of screen time and, frankly, a pretty objectively evil character, what do you do as an actor to make him interesting and distinct? Love it! Just had this conversation last night with some incredibly wonderful and talented actors. First, serve the characters needs/wants and that of the story! From there, I like to find the grey areas. Finding the humor in the darkness and finding the darkness in the humor. NOTHING is black or white and I love trying my best to explore that in each and every character I play. Not always successfully of course, but a boy's gotta try! Ha ha. The character becomes interesting or distinct through finding a common thread or a humanity to them that people will relate to. Once someone thinks, "I relate to that" whatever "that" is, I believe it sets them apart. It's the connection. Believability. Commitment. Living with this Walking Dead character over the course of the cliffhanger at least, what's the difference in playing a character who you're coming back to in a serial format? I can't remember you recurring on a TV show before. I've been most fortunate and grateful to have appeared in many rather iconic shows- be it BROAD CITY, BETTER CALL SAUL, THE WALKING DEAD, or HBO's upcoming WESTWORLD. But yes, it's been one and done on a couple of them. The difference in coming back? Well, more work obviously! Ha ha! It's exciting. It's unknown. Obviously the more opportunity I have to recur on a show - the better! It's more connection and development of the character and story. I'm there to serve both so bring it!! I'm ready, willing, and able! Grateful for each opportunity and looking forward to what lies ahead. Onwards!! !